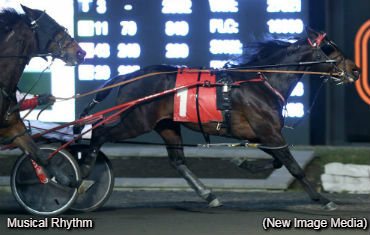 After hitting the board in four straight starts but going home winless during that stretch in the Preferred Trot class, Musical Rhythm finally got the monkey off his back with a Monday evening triumph in the top class for Team Baillargeon. In rein to Mario Baillargeon, Musical Rhythm dropped into the pocket spot in the early going while Cue Hall muscled his way to the top and carved out the opening quarter in :29. After that tepid opening panel, Baillargeon launched his charge to the outside in the backstretch, and in a matter of strides they were positioned on the lead. Musical Rhythm distributed middle splits of :57.2 and 1:26.2 before using a :28-second closing kick en route to a 1:54.2 score by three-quarters of a length over the hard-charging B Yoyo. Third prize was earned by Free Willy Hanover. It was the second win of the season – and the 31st to date – for the seven-year-old son of Cantab Hall-Musical Victory. Trainer Ben Baillargeon co-owns the career winner in excess of $750,000 with Santo Vena, Nunzio Vena and Claude Hamel. A freak collision between two trotters before Monday’s ninth race at Woodbine Mohawk Park has sent veteran horseman Roger Mayotte to hospital. Shortly after the post parade for Race 9 trotters Odds On Amethyst (Pat Hudon) and Monopoly (Roger Mayotte) collided. Mayotte was dumped out of the bike and Monopoly galloped away while Hudon was able to restrain Odds On Amethyst despite the fact his race bike was broke into multiple pieces. Mayotte received attention from the on-track EMS crew after complaining of pain in his ribs and shoulder. He was then transported via ambulance to Milton District Hospital for further medical attention. Monopoly was eventually collared and was uninjured. Odds On Amethyst was deemed fit to race despite the incident, and he went on to finish a bang-up third for Hudon. Trot Insider will share an update on Mayotte when more details are made available.